Qorum Photos will be attending all of our Grading and Evaluation days and photos will be available for purchase via their website as soon as possible after the Tour has finished (note that it is unlikely that there'll be time to upload the photos during the tour due to the need to travel each evening to the next location). As a condition of their attendance, we are unable to allow any other commercial photographers at the event so, although family and friends are fine taking photos of ponies they are there to support, please limit your photography to this as otherwise we may be unable to secure such services in the future which would be a great shame. Hans-Heinrich Brüning & Jacke Mathieson will be the lead judges at all of the Mare Gradings and, after all mares have been inspected and marked at the last published venue of the day, the highest scoring mare of the day* will become the Champion Mare and the next highest scoring the Reserve Champion Mare for that day. Both will receive an extra rosette (this will be posted if winning mare is not at last venue) and the Champion Mare will also get a sash. 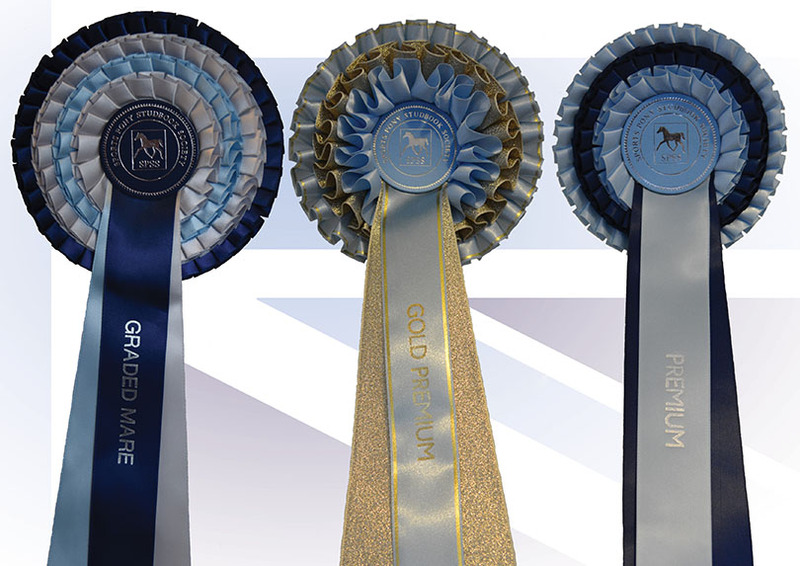 Then, after the last mare grading, the mare with the highest score across all of the venues will be declared as the 2018 Supreme Champion Mare and receive an additional rosette & sash. The next highest scoring mare will become the 2018 Reserve Supreme Champion Mare and receive an additional rosette & sash. Hans-Heinrich Brüning & Jacke Mathieson will be the lead judges at the Stallion Gradings. Provided that at least 5 stallions have been inspected on the day, the highest scoring stallion of that day will be declared as the Champion Stallion for that region(s) and will receive an additional rosette & sash. The next highest scoring stallion will become the Reserve Champion Stallion. The SPSS reserves the right to combine or split days/regions depending on entry numbers (we anticipate that a minimum of 5 stallions need to have been inspected for a Champion/Reserve to be declared). Then, after the last stallion grading, the stallion with the highest score across all of the venues will be declared as the 2018 Supreme Champion Stallion and receive an additional rosette & sash. 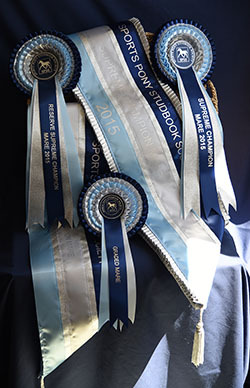 The next highest scoring stallion will become the 2018 Reserve Supreme Champion Stallion and receive an additional rosette & sash. The Regional Youngstock Evaluations are open to filly, colt and gelding foals, yearlings & two year olds (plus 3 year old fillies & geldings) bred to be competition ponies or small competition horses (up to 158cm unless SPSS passported when there is no height limit) regardless of breed, passport or colour. Each entrant will be evaluated individually for conformation and paces (in-hand & loose) with loose jumping as an option for those 2 and 3 year olds destined to be show jumpers or eventers. With our regular grading judge, Hans-Heinrich Brüning, flying in from Germany for all of the regional evaluations, all participants will get a mark/comment sheet (sent after the event) and those gaining at least 7.0 will be awarded a Premium Rosette unless they score 8.0 or higher when they will get a Gold Premium Rosette. Youngstock do not have to be SPSS registered nor do owners have to be SPSS members. After all the evaluations have been completed, the youngster with the highest score overall will be declared the 2018 Supreme Youngstock Champion with the next highest scorer being the Reserve Supreme Youngstock Champion. Special rosettes will also be awarded for the Top Colt, Top Filly, Top Gelding, Top Foal, Top Yearling, Top 2 Year Old, Top 3 Year Old, Top Pony and Top Small Horse. The judges will adjudicate if there are any cases of equal scores. Click here to download an information sheet about SPSS Mare Grading & Performance Testing. There will also be the opportunity for mares to be performance tested at every SPSS Tour venue. 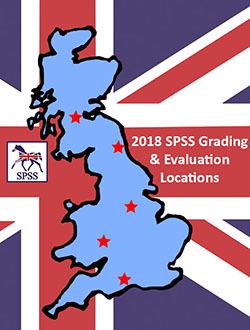 This will be open to all SPSS graded mares who are 4 years of age or older and it will be possible for the mare to be graded earlier on the same day. It is the perfect opportunity for those whose young mares were graded before they were backed, or for those with older mares who are presenting them for grading while they are in ridden work, to showcase their mare’s ability under saddle as a sports pony. We will follow the continental model for this, with the mares initially being ridden by their own rider in small groups (3 or 4) of similarly aged mares. They will be assessed in walk, trot & canter on both reins for their way of going, their gaits & temperament with ridden and loose jumping as an option (no mare will be disadvantaged for not jumping). Then all mares which pass this initial assessment will be ridden by our test rider who will score their rideability. The overall performance test mark out of 10 for each mare is then calculated by averaging all the judges’ scores given to a mare, with 7 or above being considered a pass. All successful mares will get a certificate and a rosette or plaque then, at the end of the year, the highest scoring mares will be announced as the 2018 Mare Performance Test Champion and Reserve Champion. 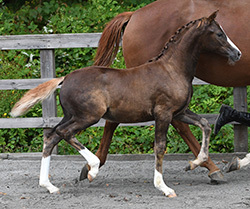 We very much anticipate that this addition to our Grading & Evaluation schemes will offer a very valuable extra method for breeders to evaluate and promote their breeding programme, whilst also allowing sports pony producers to an opportunity to add a quantified achievement to their ponies and small horses (up to an expected mature height maximum of 158cm). All entries for September events close on 13th August 2018. Early entry is advised as spaces will be allocated in order of receipt of entries and once capacity is reached at each venue further entries will be placed on a waiting list. If there is space, late entries may be taken, please call the office on 07703 566066 to check. Late entry supplement £10 per pony for grading entries and £5 per pony for youngstock evaluations. We would appreciate early entries so we know that a venue will be viable. Note that should a venue not be viable and be cancelled then a full refund (of all fees paid when entering) will be made. Each entrant will be allocated a time slot(s) and these will be emailed out a few days before each event. We plan to have lists of entrants available on the day for spectators and to also publish approximate start & finish times in advance. Stabling at the venues must be booked with each venue directly. The SPSS Rule book can be download here. Specific rules for the Youngstock Evaluations can be found in the schedule. For more information about the grading/evaluation process, turnout etc, please see the Info & FAQ page (here). The lead judges at all the stallion & mare gradings & youngstock evaluations will be Herr Hans-Heinrich Brüning and Mrs Jacke Mathieson. Hans-Heinrich is a well known German judge and breeder of Hannovarian dressage and jumping horses at his family farm, Hof Brüning, which is well-known for its solid preparation work of horses for licensings, mare shows, stallion and mare performance tests as well as auctions, shows and championships. Hans-Heinrich has judged at the SPSS mare and stallion gradings since 2010. Jacke Mathieson is a breeder of warmblood horses and sports ponies. She owns the warmblood Wolkenderry and competes him and his progeny in dressage. Jacke also imported the SPSS graded pony Classic's Charmeur who initially stood at stud with her before being sold to a young rider, with whom Classic's Charmeur has competed at FEI Pony level internationally. Jacke has been SPSS Chairman and judged SPSS Gradings & Evaluations since 2014. Qorum Photos will be attending all of our Grading and evaluation days and photos will be available for purchase via their website as soon as possible after the gradings have finished. As a condition of their attendance, we are unable to allow any other commercial photographers at the event so, although family and friends are fine taking photos of ponies they are there to support, please limit your photography to this as otherwise we may be unable to secure such services in the future which would be a great shame.